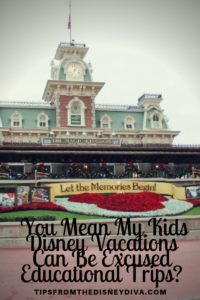 Throwback Thursday: You Mean My Kids Disney Vacations Can Be Excused Educational Trips? Several parent friends of mine have been shocked over the last several years, as we have pulled out boys out of school for a week to go to Walt Disney World. They can’t fathom that we would not only approve of them missing a week of school, but pull them out for a week to go to Walt Disney World of all places. I mean, it’s a theme park with roller coasters, how on earth can we excuse them being out of an educational environment for THAT?!? What if I told you that, yes, not only do we pull our kids out of school for a week, but this week has been (up until now and hopefully continues to be) excused as an educational trip. That means the five days they are absent are totally excused and do not count against them. If you have ever been to Walt Disney World Resorts, you know that there are absolutely TONS of educational opportunities. 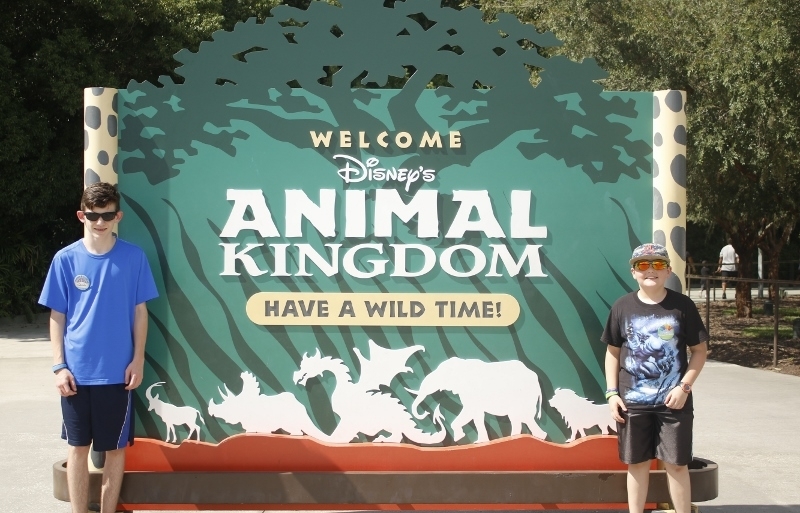 Let’s start with the most obvious park, Animal Kingdom. There are so many educational things to learn at Animal Kingdom. Just take a trip on Kilimanjaro Safari. Along the way, you can learn a variety of facts, not only about all the various animals who live there, but about the trees and surrounding habitat as well. 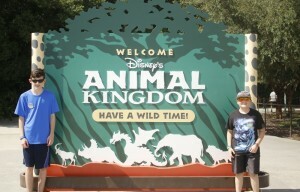 Animal Kingdom is all about conservation and preserving animals. Any of the cast members at the park are more than willing to impart their wisdom on a variety of subjects if asked, all in the name of educating you. Another glaringly obvious park that is packed with educational value is EPCOT. Don’t believe me? 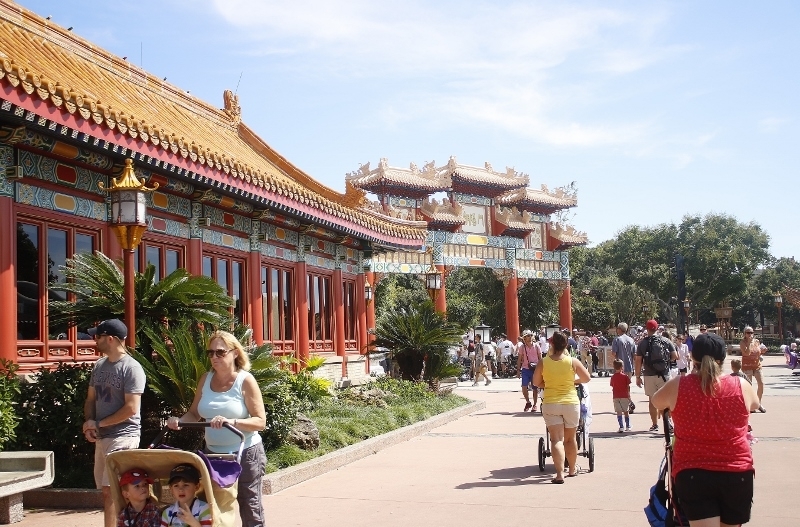 Take a walk through World Showcase. You get to experience the culture of eleven different countries, Norway, Mexico, the United States, Canada, China, United Kingdom, Germany, Italy, Japan, Morocco and France. Taste the foods made famous by these countries, view the art native to the countries they are presented in, admire the architecture of buildings in the countries, hand crafted to resemble as closely as possible, the architecture in the real countries across the globe. Everything presented to you by Cast Members who were originally born in the countries they represent in World Showcase. Next you can stroll over to Spaceship Earth, where you can take a slow journey through time, from cavemen to current day, and learn about various inventions which have furthered our species to date. There are even educational things at Disney’s Hollywood Studios and Magic Kingdom. 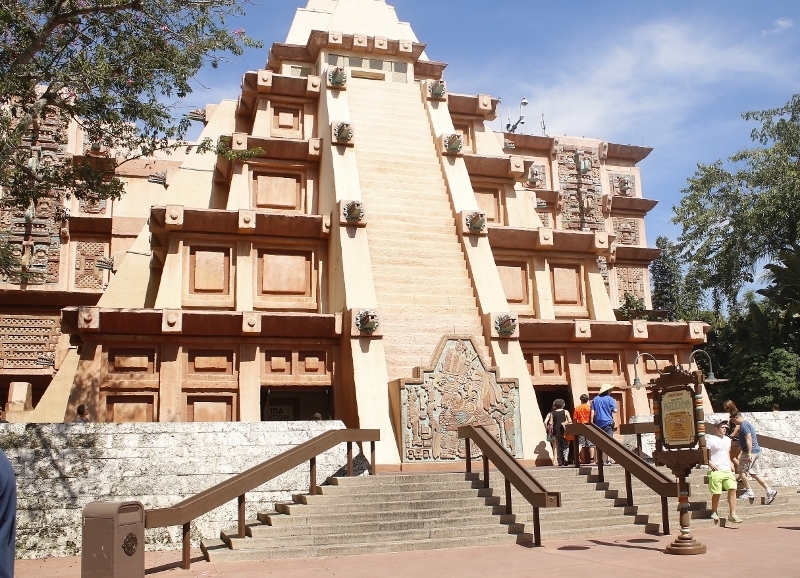 Learn about those old Hollywood movies on The Great Movie Ride. 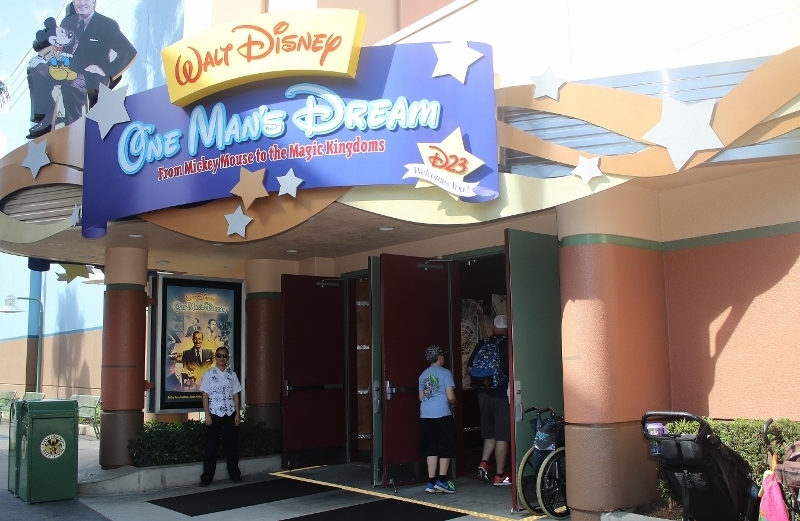 Discover some tidbits of information about Walt Disney himself at One Man’s Dream. Check out the Hall of Presidents to learn about our great forefathers. 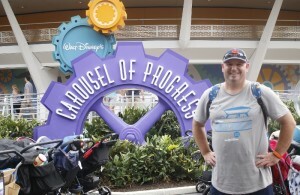 Take a spin on Carousel of Progress for some great examples on how our technology has advanced since the turn of the century. 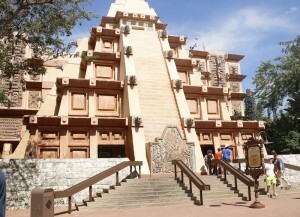 Have I convinced you of how educational Walt Disney World Resorts is yet? 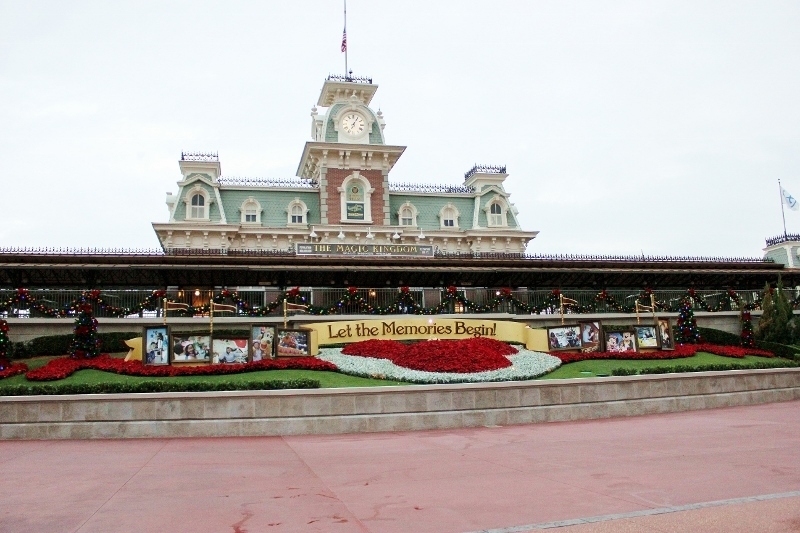 Do you see how Mr. Disney wanted to make his parks a learning experience as well as a fun family experience? Are you now wondering how I’ve managed to get my children’s absences excused? I can only give you information on how our family works with our school system to obtain that coveted educational excuse, but maybe it can help you in some way. 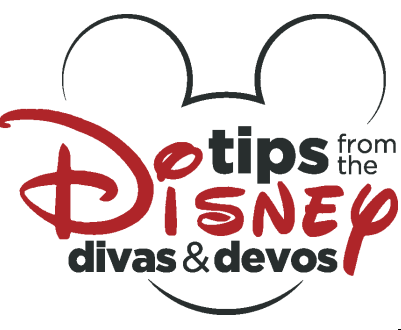 Disney Diva Tip #1: I actually start before the school year even begins. I go online to my school system website and I find a copy of the form I need to fill out to request (of course, a request is not a guarantee) that the trip be excused. I print and fill out the form well before our trip, and turn it in to the school office. Here is a copy of what the form for our school system looks like, Educational Trip form 12-13, your school forms my look different. On our form, I write in a few of the educational items my children will learn and be exposed to at the parks. Be as informative as possible with as many people in the school system as you can, every ally you can make helps! I make sure to turn the forms in as early as possible so the principal will have time to go over it and decide whether or not they want to sign off on it as an excused trip. This is the hardest part, waiting for the feedback as to whether or not he/she will approve our form. I’ll be honest, after paying for the trip, we are going to go, regardless of the signature on the form, but it helps to know these days will be excused. Disney Diva Tip #2: Now that you’ve been lucky enough to have your trip approved, be prepared for the make-up work. I usually let my kids teacher’s know right off the bat that they will miss a week. The more prepared they are, the better off your kids are. As the trip date approaches, usually about two weeks before departure, I will send out an email to all of my kids teachers, reminding them of our upcoming trip, and letting them know that I will probably request they send home as much of the work the boys will miss BEFORE we leave as possible. It’s not always possible that all the teachers can send much, if any, work home early, but if even just one teacher can send work home early, that’s less work for your child to do when they get home from vacation. Disney Diva Tip #3: Be prepared for EXTRA work, on top of make-up work. As your kids get older, the school work load gets heavier. My youngest son is in middle school. In order for his trip to be excused, he had to write a one page paper emphasizing all he learned while on vacation. My oldest is in high school. This past year, he had to write a one page PER DAY MISSED paper about all he learned while on vacation. That means he had to write a five page paper. It’s really not a hard assignment, but my recommendation would be to take a few notes and pictures to help your child remember all the tidbits of info he or she will learn. 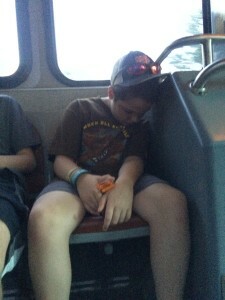 Disney Diva Tip #4: Be prepared for that post-Disney vacation exhaustion to hit on the first day back to school. Yes, you were just on vacation, but it was a Walt Disney World vacation. That means there was a LOT of walking. A LOT of early days and late nights. A LOT of exhaustion. Just be prepared for the fight of getting them back to school. It’s not easy, but it’s worth it. There you have it, this is how my family request’s approval for having our boys Disney days excused as educational. Keep in mind, your school system will only allow you a limited amount of excused educational days, for our school system, five days is the max allowable. Also keep in mind, every principal and school system is different, they won’t all be lenient, they won’t all see how educational the parks truly are, and they won’t all excuse your child; however, you won’t know unless you ask, right? 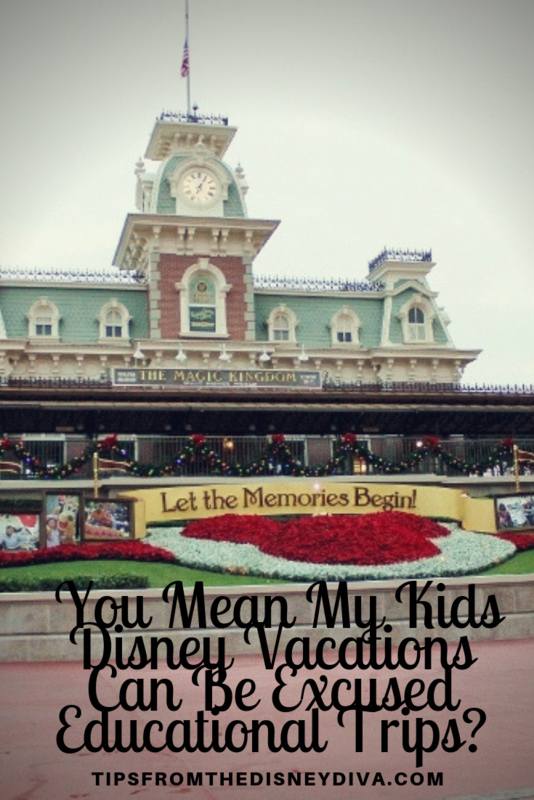 Tips for Surprising Kids with Disney Trips! I create (or download) a template for each day at Disney since we always go during school when the crowds are lighter. This will keep the kids writing and thinking. It’s also good for those kids assigned writing projects about their trip. Each page will have a spot for recording the temperature, the characters met that day, their favorite ride, and favorite event or show. Then have lines for paragraphing what their favorite memory for that day was. Younger kids can use that for show-and-tell. Older kids can use it to refresh their memories for school assignments they may have been given regarding their trip.